Paramount has set release dates for the seventh and eighth installments of the “Mission: Impossible” series. The still-untitled “Mission: Impossible” 7 will hit theaters July 23, 2021, with part 8 coming just over a year later, on Aug. 5, 2022. The news comes just two weeks after the announcement that Christopher McQuarrie will return to write and direct the next two films in the Tom Cruise-starring action series. McQuarrie wrote and directed 2015’s “Mission: Impossible – Rogue Nation” and last year’s “Mission: Impossible – Fallout,” which, globally earned $682 million and nearly $800 million, respectively. 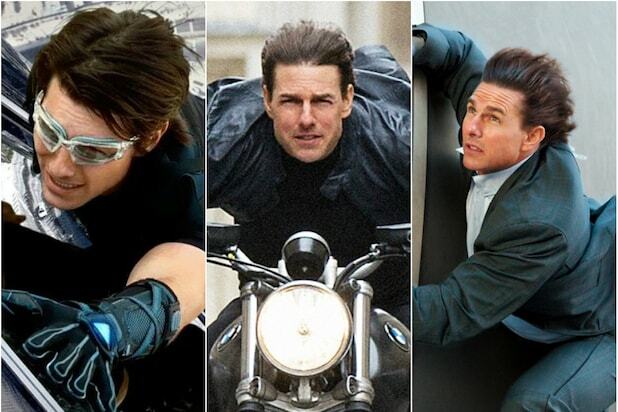 The "Mission: Impossible" films are undoubtedly Tom Cruise's bread and butter -- the franchise helped propel the now 56-year-old actor into an action star. But Cruise hasn't gone at it alone. In addition to Ving Rhames -- the only other actor to appear in every "M:I" film -- and the likes of regulars Simon Pegg and Michelle Monaghan, the 22-year-old franchise has seen a number of big name, or otherwise surprising actors, choose to accept the mission of starring alongside Cruise. Here are 19 of the actors you may have forgotten, or didn't even realize had a role in the "M:I" franchise. The "Midnight Cowboy" and "Deliverance" actor played Jim Phelps, an IMF mole whose double cross leads to Ethan Hunt's team being killed in 1996's "Mission: Impossible." After playing an assassin looking after and teaching a young Natalie Portman in "Léon: The Professional," Reno turned to "M:I" to portray disavowed IMF agent Franz Krieger. As part of Ethan Hunt's initial IMF team, Kristin Scott-Thomas, portraying Sarah Davies, is killed early in the movie after a mission goes wrong. The renowned British actress, who won an Oscar for her supporting role in 1977's "Julia," plays arms dealer Max in the first "M:I." "The Breakfast Club" alum was uncredited as Jack Harmon, a member of Ethan Hunt's first IMF team, who also died early in the first film. Gleeson plays John McCloy, the CEO of pharmaceutical company, Biocyte, which is responsible for the creation of the "M:I 2" biochemical macguffin and its cure. Maybe better known for his TV role on "Lost"-- or for being Tom Cruise's cousin -- Mapother plays a henchman named Wallis in "M:I 2." Before spending six seasons on TV series "Prison Break," Purcell, along with Mapother, played a loyal henchman to M:I 2" bad guy Sean Ambrose. Sir Anthony Hopkins had an uncredited role in "M:I 2" as Mission Commander Swanbeck, the head of the IMF, who brings Ethan Hunt out of vacation. In "M:I 3" Crudup plays IMF operations director John Musgrave, who, after pulling Ethan Hunt out of pseudo retirement, it is revealed is working with Philip Seymour Hoffman's Owen Davian. Meyers is added to the "M:I" team for the third film, playing IMF agent Declan Gormley. Before portraying a sleeper agent for the KGB in FX's "The Americans" this "Felicity" actor got some experience as IMF agent, and Ethan Hunt's protégé, Lindsey Farris in "Mission: Impossible III." After three films as Morpheus in "The Matrix" franchise, Fishburne hung up his leather trench coat and donned a suit, portraying head of the IMF Theodore Brassel in "M:I 3." It's a small role, but before "Breaking Bad's" Jesse Pinkman, Paul played Tom Cruise's brother-in-law Rick Meade in "M:I 3." Patton joined Ethan Hunt's IMF team for a single film in the fourth "M:I," as agent Jane Carter, after her romantic interest was fridged early in the movie. The British actor, who's racked up some 127 credits, had a small, uncredited role in "M:I-Ghost Protocol" as the IMF Secretary. In one of her first major American roles, French actress Léa Seydoux, plays assassin henchwoman Sabine Moreau in "M:I-Ghost Protocol." Another "Lost" alum, Holloway plays IMF agent and Patton's love interest Trevor Hanaway, whose death early in the film at the hands of Seydoux's assassin leads to Patton's character joining Ethan Hunt's team and seeking revenge. The "Pride & Prejudice" actor plays the British Prime Minister who has a central role in "M:I-Rogue Nation" in uncovering The Syndicate.